Unwanted Christmas day present to the Broads. Following the alert issued by the Environment Agency on the lead up to Christmas of potential saline incursion, some of our caring and passionate anglers went and visited the River Bure at Acle Dyke at 10:40 am Christmas Day. What met them was a dyke full of dead and dying fish and seagulls in heavy concentration feeding off the dead and dying fish at the river end of the dyke. This was reported to the EA at 11:09 incident number 4192560. 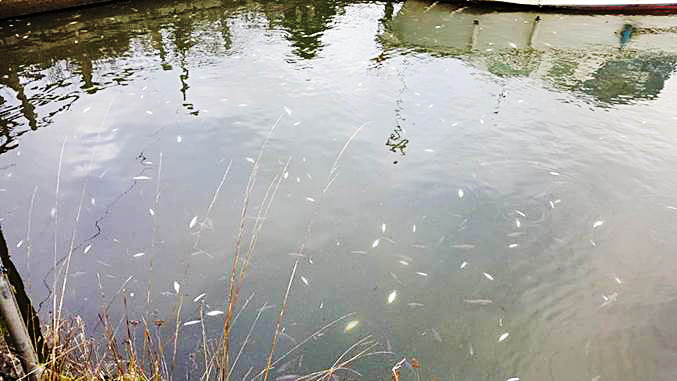 They estimated between 20,000 – 30,000 fish were impacted. However, within a few hours, not a sign of dead fish was to be seen as the sea gulls tucked into their Christmas lunch and left not a scrap of evidence. From the EA hydroacoustic surveys and verified by anglers catch returns, taking the average fish density in the River Bure it is estimated it supports around 1,800,000 fish. So the impact of losing 20,000 fish although significant to the specific location, may not significantly impact the wider fish community very much, but this is not an isolated incident and can only be sustained say as a 1 in 5-year event, we are currently experiencing these events all too often. What it does say however, is that this needs close management and strong science, supported by the resource from the statutory body the Environment Agency, who currently struggle within their allocated budget to resource this. Indeed recent correspondence states their inability to resource electrofishing survey findings across Norfolk. If these fish were left dead, all smelly and rotten, then there would be a public outcry. But because they disappear within hours, then nobody seems to care, apart from some anglers given up their Christmas morning, the unsung heroes. Copyright © 2018 Broads Angling Services Group CIC. All Rights Reserved.